Somewhere along the path, every writer faces the fact that the ancient Greeks were right about there being Muses who inspire and incite us. And everyday we are looking to be in good communication with her/them so that we may attempt to reach creative greatness. I’ve come to see the importance of cultivating my relationship with my Muse, showing her that I am open, listening and ready to receive the flow of inspiration she is streaming to me. So, every morning I walk. It allows me quiet time to set my intentions for the day and acknowledge my gratitude for all of the wonderful ideas I am going to receive. Over the years, I have become aware of how the walking/expressing gratitude combo also gets my endorphins going. I think it turns the frequency up on my receptivity. Now that it’s summer, there are school aged kids in park. They chase each other and they skip around the track like Dorothy on the yellow brick road. And you know what? Every single one of them has a smile on their face. Talk about raging endorphins and high frequencies! I wanted to feel the heightened sense of happiness those kids did. So, even though I felt totally lame, I broke past my fear of humiliation and skipped. It’s a completely different experience than running. The muscles work in a way that seems foreign and yet familiar, and it demands you use your core. But best of all, I began smiling, almost immediately and I definitely left the park feeling more connected to my little girl self. I knew the Muse was pleased because I had a very tuned-in day where old ideas expanded and new ideas flooded in. I could see that my articulation of my characters and the events they were experiencing was becoming more compelling. My left brain wanted to know more about this endorphin effect so I went to the web, where I discovered there is actually a sport called rope skipping. Australia even has a website devoted to promoting rope skipping. That’s not what I had in mind. In fact it’s just the opposite. I’m not looking for competition. I want stimulation that promotes a positive environment for creation. At The Dumb Little Man website Dr Kavetha suggests imagining yourself as a child to foster creative problem solving, because kids are naturally good at thinking outside the box. Yes, I get her drift, but my thoughts went one step further. What if we actually acted like kids? 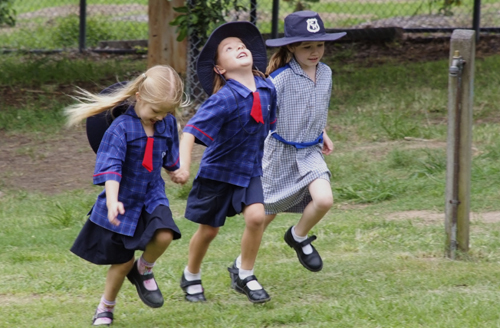 If we used our recess time to skip around would we find that our creativity would expand? It’s a bit like Laughter Yoga, a happiness exercise begun in India and now practiced in 72 countries. Clinical research has proven that laughing 10-15 minutes a day will increase one’s sense of happiness and fosters a positive attitude. Not finding any research to support my hypothesis, I have decided to become my own guinea pig. After all, there doesn’t appear to be any downside to skipping. And I don’t need a class or a trainer. I just pick up my legs and before I know it, I feel my child self emerge and my thoughts shift from the mundane. And I can sense that the Muse is happy that I have joined her in the higher frequencies where creativity lives. How about joining the experiment and reporting back? Come on. You’ll only feel like a crazy person for a few minutes and then you’ll feel too good to care what others think. Can’t wait hear if it helps your writing. I love how you have found a different track for Free Play to begin! As when people take acting classes, certain exercises encourage the world of fantasy and imagination to resurface and develop. The imagination is a very real sense. The skipping can release images from your subconscious. Your creative will is touched! Beautiful my dear friend! I read this and loved it before I even realized that I know you and love you too.